Novus Rider speed camera detector warns of fixed and mobile speed cameras. With spoken voice alerts and LED display Novus Rider announces and displays the legal speed limit when approaching UK speed camera locations. Novus Rider is powered via an internal rechargeable lithium-ion battery providing up to 8 hours of operation. Novus Rider has been designed to be plug and play and is pre-loaded with the latest speed camera database, ready to use. Novus Rider has been discontinued. Accessories including the USB update cable are still available for your GPS Rider to view them all click here. Looking for a speed camera detector with FREE speed camera updates? You may wish to consider the Snooper MY-SPEED XL. Novus Rider is 100% legal, state of the art speed camera detector with spoken voice alerts of UK speed camera locations. Novus Rider is powered by an internal rechargeable battery for wireless operation providing up to 8 hours of use. Novus Rider is also supplied pre-loaded with a comprehensive speed camera database updated, and is ready to use straight from the box. Novus Rider provides information of fixed, mobile and red light camera positions and accident black spots, making clear voice announcements. Novus Rider will warn you to reduce your speed if you are approaching a speed cameras site above the speed limit. Novus Rider speed camera alert system features an LED display, which provides the user with additional information to the voice announcements. Whilst driving the Novus Rider will display the current speed of your vehicle. On approach to a speed camera location Novus Rider first sounds a chime followed by a voice announcement such as 'Warning speed camera 500yards ahead - limit 30mph'. This will typically happen at 500yards from the speed cameras position, (in some cases a 500yards warning is not ideal because of the road layout). A second chime is heard at 200yards from the speed camera site, and if the vehicle is still over the speed limit, a continuous warning is heard 'Warning - reduce speed' until the vehicle speed drops to the speed limit, or the speed camera site has been passed. Novus Rider is powered via an internal lithium-ion rechargeable battery. 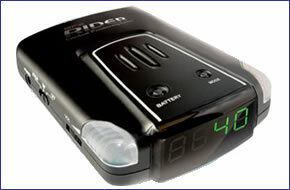 This provides 4-5 hours operation in normal mode and 7-8 hours of operation in low power mode. The Novus Rider internal battery can then be charged either by the in in car power lead or a PC/laptop using the USB cable. Both cables are supplied as standard with the Novus Rider. Typical in car battery recharging time is 70 minutes; by PC USB cable 140 minutes. Debutant from the firm formerly known as Talex impressed. The compact unit has a rechargeable battery, plus an earphone socket for motorcycle use. It got all our traps and gave voice warnings with visible confirmation. While the one-line display wasn't easy to read and the unit proved slow to unhook when we turned off before a camera, the great price includes free updates for life - so it's our champ. Why it won: Versatility, accurancy and price secured our top award for the Novus Rider, which has emerged from the old Talex company. A rechargeable battery and earpiece mean it can also be used when on two wheels, or take the pressure off the cigar lighter socket in your car. It gives both voice and visual warnings, plus spotted all the traps on our test route. Add this to free database updates and you have a winner. Novus Rider is easy to install, taking seconds to install and remove from your vehicle. The Novus Rider is installed on your dashboard via the supplied Magnetic Mount. Novus Rider uses an internal battery for operation, providing up to 8 hours of use. Novus Rider can be charged in car by the in car power lead or in the home or office via the (supplied) USB cable. Novus Rider is preloaded with a comprehensive speed camera database. Updates are free to download and require a PC with USB port and Internet access. *** Novus do not fully support Windows Vista, however a USB Driver is available for download. Want to add accessories to your Novus Rider? We sell a very limited selection of genuine Novus parts and accessories. Question: How can I update my Novus GPS Rider? Answer: We have never offered the speed camera updates for the Novus GPS Rider. They have always been available from the manufacturer - Novus. Updates could be acquired via Novus’s website. However, Novus discontinued their speed camera detector range in 2012. We are therefore unsure whether Novus still issue new speed camera database updates. View the latest range of speed camera detectors that we sell please. Do you have a question about the Novus GPS Rider? Submit your question via our contact page.